David Mark Eckstein (/ˈɛkʃtaɪn/; born January 20, 1975) is a retired American professional baseball player who was an infielder in Major League Baseball for ten seasons. He played college baseball for the University of Florida, and has played professionally for the Anaheim Angels, St. Louis Cardinals, Toronto Blue Jays, Arizona Diamondbacks and San Diego Padres. Eckstein won the 2006 World Series Most Valuable Player Award. Eckstein played baseball all four years at Seminole High School in Sanford, Florida. He was a two-time all-state selection, and a prominent member of a state championship team. He was also a member of the National Honor Society and the Fellowship of Christian Athletes. Eckstein was voted "Most Helpful" in the Class of 1993. In addition, Eckstein played American Legion Baseball for Post 53. At the University of Florida in Gainesville, Florida, Eckstein was a walk-on player for coach Joe Arnold's Florida Gators baseball team in the fall of 1994; he later earned an athletic scholarship. A standout in the Southeastern Conference (SEC), he was a first-team All-SEC selection in 1995 and 1996, a first-team All-American in 1996, a three-time SEC Academic Honor Roll selection (1995–1997), and the first two-time Academic All-American in Gators baseball history. Eckstein was a member of the 1996 Gators squad that finished third in the College World Series. He was inducted into the University of Florida Athletic Hall of Fame as a "Gator Great" in 2007. Eckstein also played for the Harrisonburg Turks of the Valley Baseball League in Harrisonburg, Virginia. Eckstein was drafted by the Boston Red Sox in the 19th round of the 1997 amateur draft, and selected off waivers by the Anaheim Angels on August 16, 2000. During the 2002 championship year, he led the major leagues with three grand slams, including grand slams in back-to-back games against the Toronto Blue Jays, one of which was a walk-off grand slam leading the Angels to complete the sweep over Toronto, at a time when the Angels were 7–14. After the sweep of the Jays, the Angels went on to win 20 of their next 23 games. At the end of the 2004 season, Eckstein was part of a "shortstop merry-go-round," in which three free agent shortstops swapped teams: Edgar Rentería went from the Cardinals to the Boston Red Sox, Orlando Cabrera went from the Red Sox to the Angels, and Eckstein went from the Angels to the Cardinals. In his first seven seasons, he amassed 1,079 hits while batting .286. He was voted to the National League All-Star team in 2005, along with teammates Chris Carpenter, Albert Pujols, Jason Isringhausen and Jim Edmonds. He was a late addition to the 2006 All-Star team. In 3,772 regular season at-bats, Eckstein struck out only 305 times, with a total of 22 in 2007. 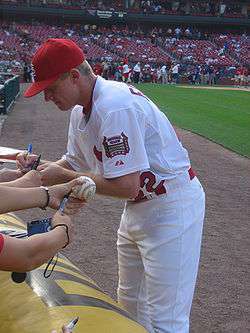 Eckstein signing autographs before a May 30th game against the Houston Astros in 2006 as a member of the Cardinals. Eckstein was a fan favorite in St. Louis, who considered him to be a "pesky" hitter (he chokes up on the bat about 2 inches). On Mother's Day, May 14, 2006, Eckstein was one of more than 50 hitters who brandished a pink bat to benefit the Breast Cancer Foundation. As a member of the 2006 World Series Champion St. Louis Cardinals, Eckstein was named the World Series MVP. Following a 1–11 start in the first 2 games of the World Series, Eckstein went 8 for 22 with 4 RBI and scored 3 runs in the series, including going 4-for-5 with three doubles in game 4. The World Series victory with the Cardinals made Eckstein one of few starting shortstops who have won a World Series in both the American and National Leagues. Eckstein was brought back in front of over 47,000 fans to throw out the first pitch of Game 6 of the World Series in St. Louis on October 27, 2011. On November 5, 2007, Eckstein became a free agent along with Kip Wells, Troy Percival, and Miguel Cairo. On December 13, 2007, he signed a one-year, $4.5 million contract with the Toronto Blue Jays. On August 31, 2008, Eckstein was traded to the Arizona Diamondbacks for minor league pitcher Chad Beck. On January 15, 2009, he signed a discounted one-year contract with the San Diego Padres on the condition that he would play primarily second base. On August 22, 2009, the San Diego Padres extended Eckstein's contract through 2010. Eckstein did not join a team for the 2011 season. In June, it was reported that he received offers from the Padres and other teams, but opted to not play baseball. He is working for his wife, actress Ashley Eckstein. He officially retired on January 22, 2012. Eckstein became a candidate for induction into the National Baseball Hall of Fame and Museum for the first time on November 9, 2015. He earned two votes. Eckstein was born in Sanford, Florida. He married actress Ashley Drane on November 26, 2005, at his family church in Sanford, Florida, followed by a reception at Walt Disney World. He is a fan of professional wrestling, having made public appearances with Total Nonstop Action Wrestling during the 2006 World Series and on February 11, 2007, he co-managed (along with Tampa Bay Rays outfielder Johnny Damon) TNA wrestler Lance Hoyt for his match with current White Sox conditioning coach Dale Torborg, managed by Sox catcher A.J. Pierzynski at TNA's Against All Odds pay-per-view. His older brother, Rick, is the former hitting coach for the Washington Nationals. ↑ "David Eckstein | The American Legion". www.legion.org. Retrieved 2016-03-16. ↑ "Nine Members Inducted Into University of Florida Athletics Hall of Fame," GatorZone.com (April 13, 2007). Retrieved July 21, 2011. ↑ Schwarz, Alan (2005-03-23). "Changing places, not positions". ESPN.com. Retrieved 2009-01-24. ↑ Brock, Corey (2009-01-15). "Padres bolster infield with Eckstein Veteran shortstop eager to move back to second base". MLB.com. Retrieved 2009-01-24. 1 2 DiGiovanna, Mike (29 June 2011). "David Eckstein says he is not officially retired from baseball". Los Angeles Times. Retrieved 6 July 2011. ↑ Bloom, Barry M. (November 9, 2015). "Junior, Hoffman highlight HOF ballot newcomers". MLB.com. Retrieved November 10, 2015. ↑ "Little David Becomes A Goliath". Philippine Daily Inquirer. 29 October 2006. Retrieved 21 May 2011. ↑ "Eckstein's #2 to be Retired Wednesday, May 8". Trenton Thunder. Eckstein, David, with Greg Brown, Have Heart, Builder's Stone Publishing, Lake Mary, Florida (2006). ISBN 0-9791504-0-X. Wikimedia Commons has media related to David Eckstein.